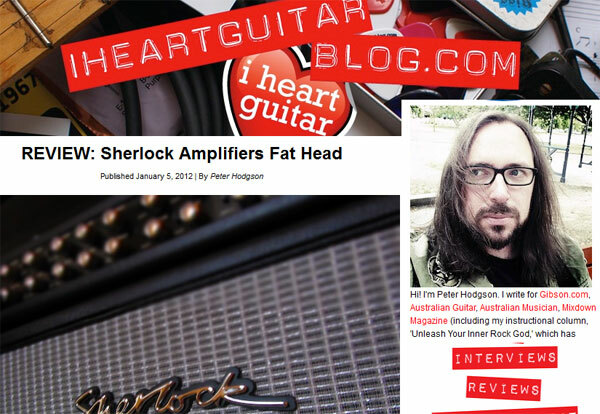 Welcome to the Sherlock Amplifiers Testimonials & Reviews page. Just some of our happy customers...There are more, plenty more. If you have a testimony email it to us and we will add it to this page. Click to see the review. Dale at Sherlock amps gave me your name as a reference. 1) have a nice chime in the clean channel for clean intros, etc. 2) rhythm channel has to be able to achieve tight, bonecrushing distortion and at the same time be articulate. I would like to see the gain knob at 7 and still be able to go to 10 without over compressing the tubes or mushing out. this channel also needs to have a powerful bass control to dial in an earth shaking sound when required. 3) Lead channel needs to have a nice creamy, violin like tone with sustain for days and yes be articulate for blazing solos and 16th note triplets. Any help appreciated. Please also comment on the tube compliments and bias setting features. Sorry I haven't emailed you earlier I've been quite busy over the weekend. Let me start with a little bit of history between Dale and myself and then I'll get to your questions. come up with the money to buy one from Dale as I had just been married and bought a house etc..
most of the impact and all the controls were still working so at the price I took a gamble and paid for it. 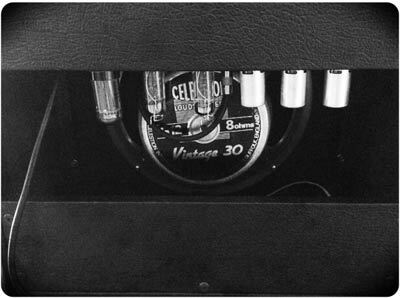 that my 50/50 serves as testimony to the reliability of a solid hand made valve power amp that Dale Sherlock builds. of yet another serious beast the "FAT HEAD"!!! approximately $60,000 worth recording equipment. Cost isn’t the issue these days. off the price. No offence to Marshall but I’ve been there done that. Remember that part of my life I’d rather forget? break up when it's pushed. pebbles not mud. IT'S GOT BASS!!!! (Not boom) Assuming your speakers can handle it? Michael. (Exceptionally- Bad Horsie!) Nuff said. system that helps you do the things that are important like playing gigs rehearsing etc. If you email Dale for information he will most likely send you something. The advantage is that you can change tubes and bias them yourself without having to leave your amp with a tube tech. It works perfectly, saves time, money and is just plain brilliant. In addition, if you want to push the tubes to the limit you can do that also, refer to manual. Your power stage is always at peak performance! And always biased correctly by you the technician. Well, you know what I mean. Oh, and if you do a tube in the middle of a gig your circuits are protected, you can bias the remaining tube in a matter of seconds. You loose a little volume but that’s as bad as it gets. (3 tubes) to a tech and the additional charges. It’s the cost of the three tubes and 1 hour. Alternatively, borrow some out of someone’s amp and do it yourself, it’s ridiculously simple. The midi stuff is a snap! And the switching is silent. Just assign and use, it's really that simple. Anyway, the main thing is that it does what a professionally designed Tube amp is supposed to do and puts all the tone and punch where it really counts! I think it’s the best head in the world. All the other stuff the amp has helps you do it more efficiently and that's what will get you the gig if you play as good as the next guy. Not to mention that eye raising “FAT HEAD” sound! Hand wound Transformers Michael. Dale is a professional and builds quality not quantity a rare find these days. Anyway, I hope this has helped somewhat. How have you been? Have not heard from you or Paul in quite a while, things must be very busy. Anyway, I am still in awe over this wonderful amplifier you have built for me. I haven't had much time lately to play it but when I do I just can't believe the sounds, clarity, richness, bass response, etc., etc. that I have always heard in my head and was not able to obtain with all the other 50 or so amps I have tried in the last 10 years. recordings done with the Fathead amp. Do you know of any other cd's done with your amp? I would love to hear the songs. Let me know on this as I would be more than happy to purchase a cd. I know Paul was going to make me some heavy clips but hasn't had time. I myself can't as I don't have the equipment. Also, I did briefly try my Tesla 6L6GC+ tubes and noticed that they had less volume than the Sovteks. I like the sound of the Sovteks better for the heavy stuff I'm trying to play. I haven't tried the El-34's yet but soon and someday I would like to try the 6550 or KT-88's. What bias ma setting would you run these at? Dale, will you be coming out with a speaker box 4X12 sometime soon? Any new pedals or gear that you are working on at present? 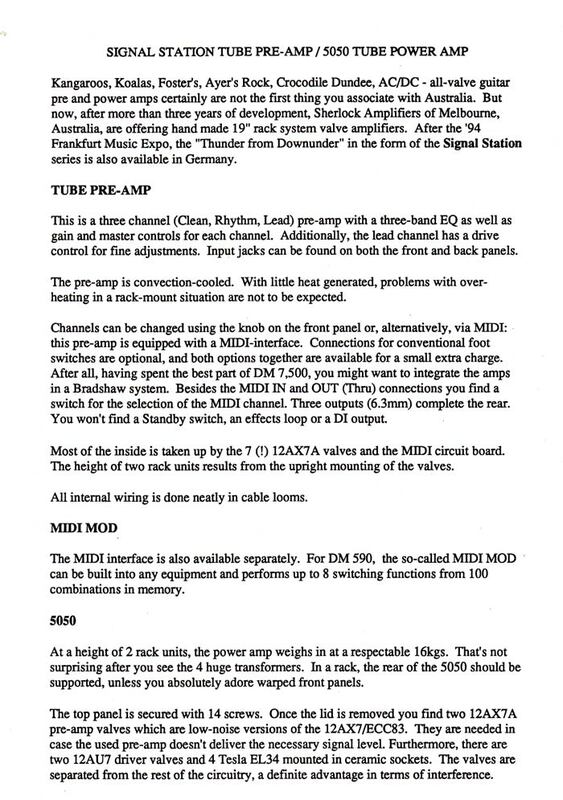 Also, how is your client list doing with guys from the U.S.A. wanting to use your amp? clips I've heard it really doesn't sound all that nice. Your amp puts it to shame in my opinion. it be so precise and easily adjusted is alone worth its weight in gold. I can't tell you how much I've spent on sending out my amp for biasing and paying $75 and waiting for 3-4 weeks! Anyway, please keep me posted and I will try to keep in touch more often. Please say hi to Paul for me. Thanks again for all your help that you have given on the amp and answering all my questions. I really appreciate it very much and will do my best to tell my friends about your wonderful amp! It seems we have the same ears for music and tones. You described the boogies to a tee. Nothing but mushy, loose undefined tone. As I've said I've tried almost every known major amp out there and your thoughts on how they sound are correct. I have owned and played an Ultralead by VHT. It was good but it was very dry and sterile sounding. Also, the eq would always fight the amps eq knobs and I could never get a decent setting so I sold it and my boogies. I have owned a Engl Savage 120 which wasn't bad but I wanted more control over the bass boost and tone settings. I sold it and bought a Framus Cobra which at first was ok but as you said had no special tone and both the rhythm and lead channel had the same voicing! So, I sold it too. I told Dale I have been buying and selling amps at a loss just to try them for a while to see if I could find an amp that we were both looking for in features and great tonal flexibility. I bought the Fathead sight unseen and talked to Dale and his good friend Paul Webber. I told him what I was trying to find for tones and based on some soundclips and Dale and Paul's conversations with me by e-mail, I bought the amp. I waited over 7 months for it to be built and let me say Dale is a perfectionist and a genius! His T.M.S. system alone is worth the price of the amp as you can bias it yourself in a few minutes and use any tube combination you desire. EL-34's, 6550's, KT-88's, 6L6's just set the bias knobs for each and when the 2 lights for each glow at even intensity you are done. No more paying for and waiting 4 weeks for the local shop to send out the amp for biasing. You can now do it yourself and I believe Dale has a patent on this as this is the first amp in the world to offer this biasing system. I have tried all the amps you mentioned except for the Powerball and all your comments are exactly as I would have described them to you. This amp as you know has 4 channels and can infinitely make up to 10 with the footswitch or go midi for I think 100+ channels. 10 is way more than enough for me. Channel 1 is where all the clean tones are with a bright switch with normal, bright and extra bright are available. This channel sounds better than any Fender I have tried as it has a rich sparkle and richness I can't really describe. The second channel can cover 60's rock, blues and say 70's rock tones. As I said this amp has infinite tonal settings in each channel it makes you dizzy. Because just turning a knob slightly really changes the tone and feel, unlike other amps where you turn the knob all the way to hear only a very slight change. These tone controls really work and work very well to help dial in really any tone you can think of. Channel 3 can do rhythms and even leads as it has enough gain to do so. The big thing is you don't have to max out the gain to get great tone and saturation. I think I am running the gain on this channel at 1 o'clock and let me tell you it is great. Channel 4 is really not for the faint hearted as when Dale built this for me I told him I wanted a Tiger and not a pussycat! Boy, did he deliver the goods. Just imagine when a tiger is going to strike with its front paw and that instantaneous strike is what this amp can do when playing power chords and such. It is so tight and articulate to say the least and in my mind s much better than a $4500 Diezel, which I have tried,also. This channel as well as channel 3 can do singing, fluid, violin like lead tones that are so rich even without processing. Right now I don't have an effects unit but the clean channel almost sounds like there is a chorus on in the background. (ever so slight) The bass response on this amp is scary and will hurt you in the chest as it does me when playing muted power chords and such. The only trouble I had was the boogie and Marshall cabs I had couldn't handle the amp! I had to buy a Diezel cab with front loaded celestion 30's in it to handle this beast. I am only playing in my garage also at minimal volumes and on occasion I can get to crank it slightly so as not to disturb the noise police. This amp I think can give you all the sounds you need as it only takes time to dial them in as a slight change in a setting or knob makes a big difference. I also forgot to add that this amp has gain boost buttons and dual volumes and presence controls. These alone are another work of art. They are voiced very different and react differently depending on say if you want that Tiger attack and mean tone or you want a nice violin like singing lead tone as well as a volume boost for your solos you have got it with these buttons. I mean I can knock things off of shelves and I am not really pushing the bass past say 1 o'clock, without the gain boost. With the boost and that presence button watch out. This is the best high gain, medium and low gain amp out there period in my opinion today. As nobody can match these features or responsive controls, especially the user biasing system alone is a big plus as no one else has it, even the almighty Diezel costing twice the money! Therefore, I hope I have shed some light on this amp for you as it has so much to offer it can't be described. I mean when I first got it and plugged it in and played my first note on the clean channel my mouth fell open. trying many amps to no avail for the last 20 years almost. If you go to acidplanet.com and look up Sherlock there are I think 5 soundclips you can listen to with the last three in a metal context. Dale can also send you a cd with those 3 tunes on them which were done by a band in Australia. Please feel free to contact Dale as he is a Gentleman and a scholar and bent over backwards to help me a little unknown guy here in the U.S. who was ready to give up searching for his great amp tone that he always heard in his head and never could get even close to with all of the offered amps he tried. I work very hard for my money and even though it was slightly more than some others I feel the price is not even an issue when it comes down to pleasurable, knowledgeable and accommodating help from someone like Dale who did always answer even the smallest detail for me and when I did not understand something he would explain it and walk me through it hand in hand. This is a sign of a true professional and a decent human being. I mean he treated me like one of the family. I am indebted to him dearly and thank him always for helping me end my quest. Sorry for all the ramblings but I had to tell you my thoughts with Dale Sherlock and his great amp the Fathead. I'm sure you will not be disappointed with one if you can get one or at least try it out. If you have any further questions let me know and I will try to help. I’m just writing to let you know that this amp you have built me is hands down the best amp I’ve ever heard and used and I just can’t stress how good it actually is. After 2 years of using it live, it really has made an impression on all who hear it. Brett Garsed (John Farnham band) recently played mine and was absolutely blown away with it and said it’s up there with his Bogner for sound and kicks it’s arse for features and usability. external effects unit. I thought it would be a bit of fiddleing around, but it all went almost effortlessly. my effects box, so I am thinking of plugging it into my mixing desk to work out where things should be set. for your advice and service, not to mention your killer amp!! P.S. Hanging out for the Sherlock cabinet. I recently picked up a second hand FAT HEAD, around 2 weeks ago. First of all, its amazing. Its perfect for the sound I am after. I am currently on tour, and at every show guitarists from other bands, and punters are intrigued with the sound I am getting, and what I am using, im sure after the weekend half of Sydney wants one! been running perfect since then. using due my tone being so good! his mate so he could check out the sound. So not just me, but everyone seems to love it! with me on tour and have Artist try it. I feel that I would be able to get your amp in some high profile places. it some competition with your amplifier. Pros: It will out do any amp available! Period. Everone who has used this head either wants to purchase one, or it makes them feel that their own equipment is inadequate. Fender twin types sound achievable, and leaves Mesa dead in the water, HIGH GAIN is a reality. Sorry guys, just being honest! This amp has more useable features than most amp heads I’ve used it put a smile on my face ever time I use it. The amp has made me want to play more! Lots more!! Cons: There is nothing I hate about this amp. It's a killer head. And it's FAT!!!! Review Summary: I would recommend this head to anyone in the professional field, or those aspiring to be so. I cannot speak more highly of the amp. Sherlock Amplifiers customer service is best I've encountered, they are diligent and ensure that your experience is professional, it is a pleasure deal with them and their products are strong on fact. "Please rate the unit on a scale of 1 to 5, 5 being the best" I'll give a six. :-) It's great!!!!! “That amp is perfect for this kind of music...” were the words uttered by Dave a few seconds after we played Rise and Fall for the first time with my new Sherlock Fat Head amp. And by the size of the grin on Rob’s face I could tell that he was pretty much thinking the same thing, and me...well let’s just say I knew exactly what I was getting myself into when I decided to buy this amp. Now enough storytelling. Let me tell you about the actual amp. The first thing that hits you in the face about this amp is that it’s loaded with features, and these are all useful features, nothing gimmicky here. Even if there may be certain features I myself may not use I can definitely see why another player may find them handy. I won’t list ALL the features here; you can go to Sherlock’s website and find out all about them there. But I will tell you that the highlight of the amp’s features for me were its 4 channels, 2 master volumes and MIDI switching capabilities. I run a slightly complicated effects set up and cannot function without MIDI switching on my amps and used to run an external midi switcher to operate my previous amps but now I have it all inside the amp and can access an array of different sounds at the press of a button without having to carry around an extra piece of equipment. 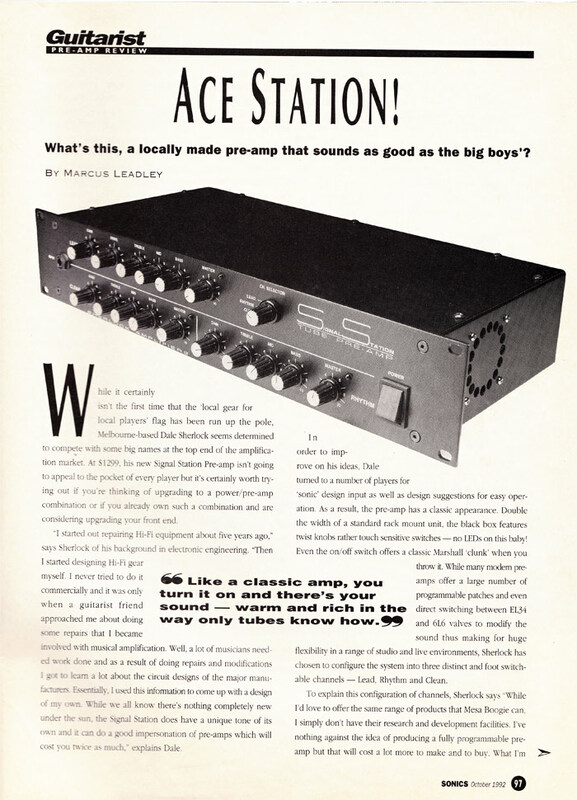 The most impressive aspect of this feature-laden amplifier is that it is priced much lower than some of the rival amplifiers out there that only have half as many features, Mesas are a great example, with an RRP that is almost double that of the Fat Head’s, it does not even come with a MIDI capabilities. Sound: the Fat Head has 4 distinctive channels, admittedly I mostly play the ‘Rhythm’ channel, but the others are all fantastic. The clean channel on this amp is the first clean channel I have ever had that actually cuts through the mix. It has tons of headroom but also comes equipped with a pre-gain knob which allows you to break the channel up should you desire to do so...mine stays relatively low for sparkly “Fendery” cleans. The second channel takes you into Plexi, JCM kinda territory while the third channel (the “Rhythm” channel) gives you bone crushing distorted metal tones that you might associate with Dual Rectos or Diezel amplifiers. Now the thing I like about this channel is that I can have the gain on ridiculously high and still have a very clear sounding tone that doesn’t go muddy, I demonstrated this to my band mates by playing a full open chord with the gain on about 9 o’clock AND a boost pedal running into the face of the amp and we could hear every single note in the chord. Truly amazing. The other highlight of this channel is its tight and quick response which is great for palm muted thrash riffage. The lead channel is very similar in tone to the “rhythm” channel but with possibly even more gain on tap. It allows you to set up a different sound for lead breaks and solos and otherwise generally allows you to have two different brutal distortion channels to do with as you please; I currently use the fourth channel as my “solo” channel and have it set up slightly louder than the “rhythm” channel. Also let’s not forget to mention that in addition all the channels have three different voicing options allowing you to choose between “bright, brighter and dark” voicing as well as a mid-cut/boost option as well as two different presence controllers, and the obviously standard 3 band EQ controls that most amps are equipped with...I almost ran out of breath just typing those last features. It's Steve here. We spoke on the phone yesterday about building a small valve power amp for a PA based guitar rig. so keep making them because I don't think there's a multi channel hi gain unit that could hold a candle to it. Can't tell you how happy i am with my amp, i get a LOT of requests about it and recommend your work to every guitarist i meet. I've been meaning to write a formal letter of praise for some time now but was wondering when you're gonna jump on the Facebook bandwagon? I'm friends with quite a few prominent guitarists and i feel like if there was a link i could cross reference you on it would spread the word a bit more. I just feel it's such a shame more pros aren't using your gear!! ps. would you mind if i called you sometime to try and resolve a couple of issues i've encountered with my amp-rack/midi configuration. I'm sure it's not the amp, rather settings or make lack of comprehension in fine tuning....it's gotten so complex and my sound is nearly perfect with high gain channels but clean has become heavily distorted...i'd have to explain the configuration but would love a few minutes of your time when you're on the downlow. Again, thanks for this wonderful amp, i'm so, so proud of it! Congrats on the new website, a long time coming but it looks fantastic! second hand, from Brett Gaskett - who bought it new in 2005.
and 2 JJ EL34's together, with all JJ preamp valves. Sherlock ad on my band's website www.chaosengine.com.au if you like. an amazing amount of tonal ground amazingly well. Thanks all especially Dale and Pete. Serial Number is 221202002. Am I correct in guessing it was made in 2002? Any way you can send me a owners manual? Also, When I engage the "gain" button on channels 3 and 4 it adds a some noise without changing the sound much. Is this normal? Should I consider a tube change. I haven't changed the tubes yet. Would you be so kind to tell me the layout? Which tubes do what? are there any updates? Mods? Tweaks? Anything suggested to change? Is it much different then getting a new one from you guys now? clean and edge share one EQ, Chan 3+4 share the other EQ. A mid scoop button is also there and can be added to any channel or combination of chan's. 2 master volumes, and 2 differently voiced presence controls with deep switches. FX loop (parallel/serial switchable). 100 Watts (50 watt switchable) slave out. amd a nifty little system that lets you bias the amp yourself. This thing kicks like a mule! I've been on an amp quest for a few months now. As far as versatility goes, the closest thing i found was a H+K triamp, but even that just didn't have the sound of this monster. It can goe funky clean through balsy clean right on thru pushed country straight past the 'plexi' territory wave at the 5150 sound and then end up in boogie-ish bogner zone. It truly does it all! I grew up listening to band playing recto's and thought, well, thats what i'm getting when i get the dollars. Had some experience with em live, they sounded large, like a big fat wall of mush, then in the shop, just sounded meh. This thing sounds like the recto should! it has a beautiful colored and textured gain sound. Big and fat, it fills the room, it also has massive punch and hits you, it also shows off your playing and notes are clear. I've only just test driven the amp and don't own it...yet, i put a deposit down, and hope to write an update review after a few months of killing my neighbors and venues. The guy there is a champion amongst men. Very busy, real easy to get along with, easy to talk to, just can't say enough about him. Thus his amp is a tribute to him. this thing is like getting whatever your dream amp is, walking up to it ina shop, a genie asking you what you want it to sound like, plugging it in, and loving every minute of it. Straight up - I test drove this amp and don't own it. This is my experience in one afternoon just like trying an amp out at a shop - but most people can't get to Sherlock so I thought sharing my experience would be helpful. It gets a ten because of the amount of options you have when ordering. The newer 2005 model has something like 6 voicing options per channel and some of those are midi assignable. This means 4 ch x 2 master (modern and vintage) x 6 voicings = 48 different sounds this amp can do. Pretty cool 'ey! Plus there's more if you tell the manufacturer what you want. You'd have to email the maker to find out all of them as it's too much to list here. Apart from that just read the reviews below. Clean (two position bright switch (plus flat)) - This channel loved each guitar plugged into it. There was a beautiful 'chimey' quality to the sound that you don't hear in many other amp heads. The tele with EMG?s sounded great though the 'bright' switch had to be in the first pos' otherwise it sounded a bit brittle (as did the strat). Each pickup change was smoother than expected with no need to 'cringe' when playing the single coil bridge p/u. This is a much better clean ch than any Mesa or Marshall I've heard. It had a nice 'sweetness' to it. I would have liked to have heard with my Keeley comp in front of it as it didn't sound as compressed as I thought it would. Fat??? Yes, indeed. Clean/Edge (two pos' bright switch) - This ch would be great for Rock/Pop, Blues (think Bogner Ecstasy) or anything where clean plus a little grit is needed. Again, it made each guitar sound great. If this or the previous channel were used for country a compressor would be really handy and, the sound would be a little more along the lines of Brent Mason, or if driven, Brad Paisley. I couldn't seem to find that 'snappy' country sound but maybe it?s there in the new model. 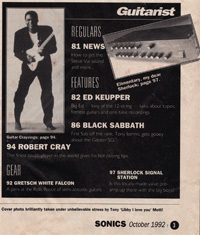 Rhythm - This channel sounded like Bogner! Yes, I have heard a few Bogners. There is so much gain on tap with this channel that you could use it as a lead ch yet when winding the gain down it still held it own with any other good rock amp. The strat in this channel, and the lead ch, sounded a lot like Yngwie's guitar sound (I really liked that). The tele sounded good too. No prizes for guessing what the double coil p/u guitars sounded like. It never got mushy no matter how hard the gain was pushed or how loud the amp got. It could only come down to opinion for not liking this sound. Beautiful! Lead - I must say that the above could be said for this channel. Not really much variation in sound other than gain and voicing options (which is still cool). Again, no matter how much the gain was pushed it remained useable and tight with no floppy bottom end. Legato runs were so easy and super-pickers like Steve Morse would love these hi-gain channels. It definitely sounds different to what?s out there but only slightly - What I mean is that it had its own 'colour' but not in a dramatic way that departs from all amps that we're used to. Overall - Very quiet even with the gain on high. I now really want to hear the 2005 model. I liked the clean channel on this 2002 model head but Dale told me that with the new model he's now 'happy' with the clean. Each guitar used still sounded like what it was, the amp seemed to take on the character of the guitar and not vice-versa. This head compares, in my opinion, with various Bogner models. I played through a H&K Triamp around the same time - the Fathead clean killed it and the triamp gain ch sounded flat by comparison (and I like the triamp). I play guitar for a living and use many amps in live and studio situations so hopefully my opinion counts for something here and you'll get an idea of what the FatHead can do. I don't really want to give this a ten here because the new 2005 models are supposed to be even better, however, the FatHead was made to be a high-gain amp and it's a definite 10 for that. I have only heard other stories so I shouldn't comment. Dale is a cool guy. Even though you can tell he's busy he won't rush you off the phone. Very informative. I play professionally and have a lot of amps in my time. I think it's time that the secret got out. Again, I haven't bought the Fathead yet but I sure will be once Dale is happy with the new model. The features have been motioned so I wont go into that side of it, only to say the name should be changed to 'THE HEAD' because it really has the goods. PRS, Les Paul, are great with this amp! It's hard to pigeonhole this amp as it has so much in the way of sound. All channels are better at high volumes! :-) Brutal?? Hmm.. That?s an inadequate word. Ha Ha Ha!! This thing doesn't have mass-produced printed circuit board. You work it out. This is the best amp that you will ever own. This hand made all tube head is hot; it has been around since 1995 and has just had a complete redesign by the manufacture. (www.sherlockamps.com) The amp is very versatile and has four channels being Clean, Edge, Rhythm and Lead. It uses Midi switching to control the pure tube channels. It comes with its own Foot Controller, which draws its power from the head via a seven-pin din plug. One lead is all that is needed. The Foot controller is also a stand alone 10 channel Midi FC and can be powered separately by a standard 9 Volt power supply, very smart company. FX with Midi can be switched (select programs) via the head, because of its built in Midi (in out/thru) and controlled by the dedicated FC. Also, there is no need to have the amp serviced because it uses a unique pat. system that allows for the user servicing of the power tubes. I have already saved a fortune in servicing costs. The hand wound transformers kick out loads of power and because I have full control over my power tube settings, I can run the tube hot for more punch, once again due to the unique pat. system. No other amp comes close and I've used many over a 20 yr period. Shhhhh! Don't let it get out! It will out do any amp available! Period. Everone who has used this head either wants to purchase one, or it makes them feel that their own equipment is inadequate. Fender twin types sound achievable, and leaves Mesa dead in the water, HIGH GAIN is a reality. Sorry guys, just being honest! This amp has more useable features than most amp head I?ve used it put a smile on my face ever time I use it. The amp has made me want to play more! Lots more!! The best I've encountered, they are diligent and ensure that your experience is professional, it is a pleasure deal with them and their products are strong on fact. According to my experience and others that have used the amp, the overall top rating is underrating already this head. There's nothing to hate, it is better than other products out there, it has more on it than any other tube head available, everything is geared toward the guitarist nothing gimmicky in any way. This review may seen to good to be true, well it's as honest. That's all I can say! I know when something is good or not. Well the specs are really "out there" I mean like check this out. 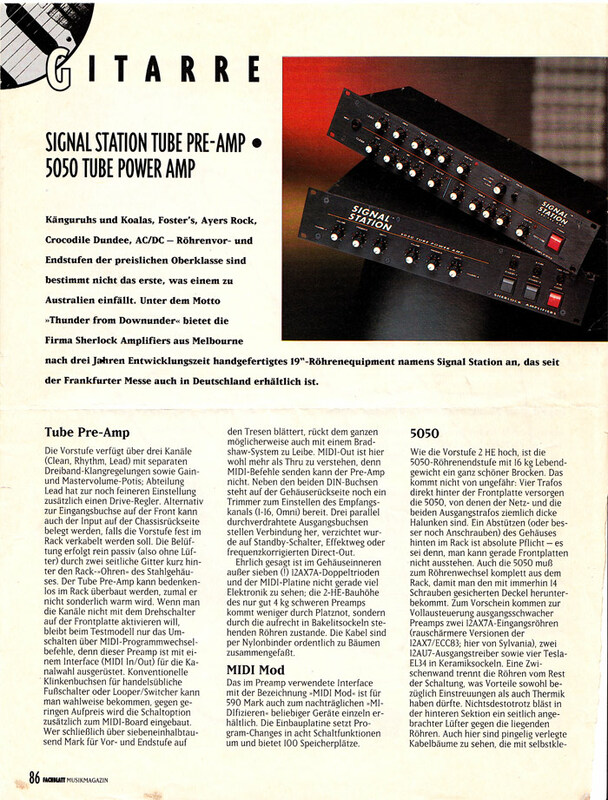 All tube technology, no solid state components in signal path. 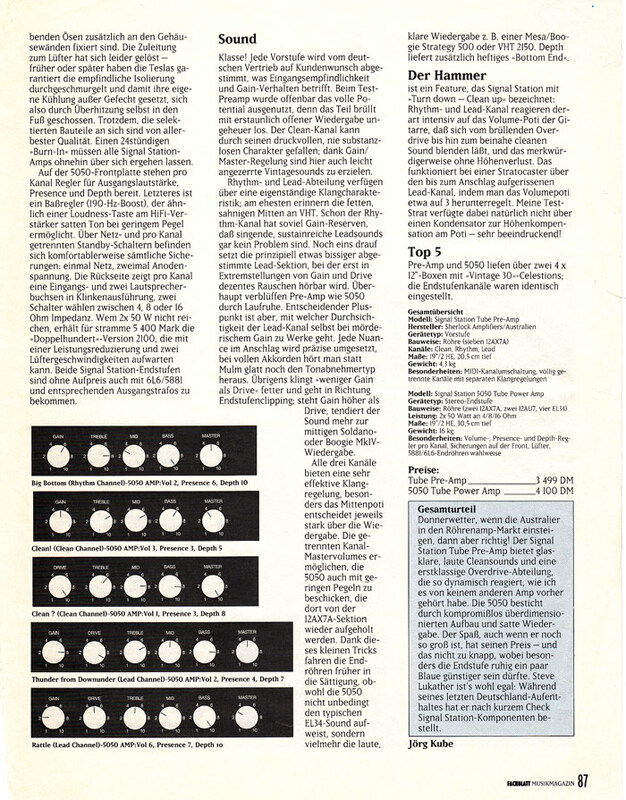 (Midi used to control switching only) 4 channels, midi assignable, Clean, Clean/edge, Rhythm, and Lead. 2 power modes, 100w, 50w, using 2 or 4 power tubes (part of TMS). Gain and Master Volume controls for each channel. 2 sets of EQ control, Bass, Mid and Treble. 2 position Bright switches for the clean channels. 2 position boost switches for dirty channels. A B master volumes, midi assignable, for volume boost in any channel. A B presence and Depth controls, midi assignable to any channel. Series, Parallel effects loop, with send and return. . Internal effects mixing via effects level control, also effects by-pass, midi assignable. Tube Management System (TMS) Power tube Bias status, indicator leds, Bias adjusting Controls and cathode fuse for each power tube. Power tube set switches, ie. tubes 1 & 4 on, or 2 & 3 on, or all 4 tubes on, or all 4 off for pre-amp use only. 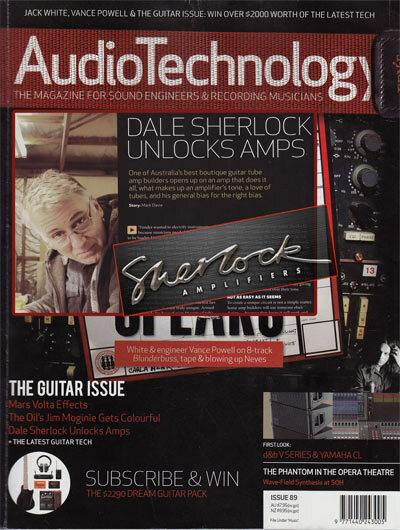 (part of Sherlock Amplifiers T.M.S.). Parallel speaker output sockets (switchcraft). Speaker Impedance switch, 16, 8, and 4 ohms. Midi in, Midi through sockets on rear and dedicated foot-switch. EL34, 6550 or 6L6 power tubes.7 High gain, selected, 12AX7 pre-amp and splitter tubes. Chrome Toggle power and stand-by switches. All other switches are chrome metal (except impedance switch. All knobs are silver chrome Telecaster type, (21 total). All sockets are metal switchcraft (except send and return). Front panel leds are 3mm clear non-diffused types, colours are green, yellow, blue, red. Optional dedicated foot switch available. Awesome, this amp head is a true tube sound because it is all tube. 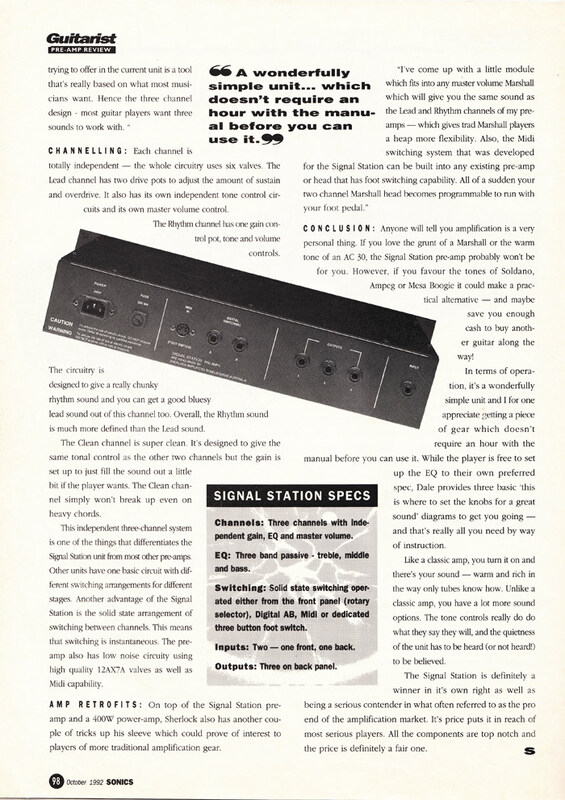 It has four channels, the clean is really clean and the lead channel well it's the best lead sound I've heard. I know that it gets down to opinion but there's all the sound that you want from fender to boogie this amp head does it! And more than that it can give you everything in between. Can't speak more highly of this head. I'm going to give it a ten here because it does everything other great amp heads do only it has more features and more channels and in my opinion kicks like a mule. Must be that awesome pre-amp section. This thing is hand built by professionals, the people from Sherlock amplifiers www.sherlockamps.com are meticulous about quality and everything is checked and double checked at every stage. Inside the head the wiring is neat and all the stuff that carries high voltage is wired of the PCB so no problem there folks! Very happy to help and very trustworthy a very rare quality these days. Expert repairs, professional, fast and lots of good advice. I would have no problem taking anything to them that needs repairing I am confident that I would get the job done right first time! Been playing for 20 yrs in both semi-professional and professional band and studio's. I own/owned heaps of rack gear and you name it... If my "FAT HEAD" was stolen I would be very unhappy about it and yes, I would get another one, I mean, I'd be stupid to use something didn't like. I like everything about this amp and I hate the fact that I can't buy two this year. I can't think of a way to improve on this head so I suppose it's right as it is. I want another one guys!!! and its amazing to actually hear yourself sit in the mix much better. I'm really enjoying the Vintage Reverb and Cab. It played its first show on Thursday night and went well and got positive comments straight away. I can't seem to sus it out. I thought the Boss daisy chain I have may have been able to but it isn't. Is there something available? Thank you for building me my Vintage Reverb 30. It really is a great amp and I love it. It’s been 4 weeks now and every time I switch it on, I’m still really impressed. It’s the only amp I’ve owned where the sound goes big into the air and the amp disappears into the back ground leaving the guitar me and the big sound. Overall the balance of this amp is very evan, from the thick tolex covering with the neat corners to the wood cabinet, when you tap it echoes back. That vintage 30 Celestion speaker sounds good and offers plenty of low end bass, tight and sometimes dark. Plugging into the low input reveal a real rich character, while in the high input just lifts the sound up a few notches and the amp starts to sing into sustain. Adding a little reverb just allows everything to take off. The black front panel looks good without being fussy with good lines adding a bit of class. Also the choice of blue light makes it look cool. From all angles this is a job well done. I just wanted to thanks you for the amp. I am very pleased with the sound & also with the quality, which suggests to me that it is a lifetime investment. 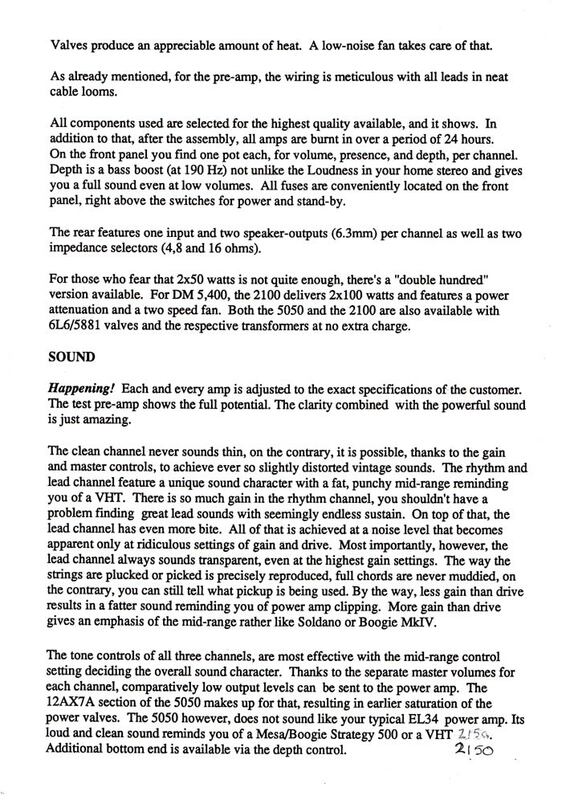 Interested to know if the speaker sounded different to the ones you use standard.Also any care for instructions? & is there a manual? The amp sounds absolutely brilliant, its just the sound our band needed. I was playing through a vox prior to your amp and the vox just lacks that low end balls and yet the Vintage 30 still has the same bright definition. As you said the amp was pretty much a bargain and im glad i got in before you increase the price of it, which would be totally justified. Apart from that one issue, i am in love with the amp its dynamics are incredible. I've recently become the proud owner of a purple Sherlock Vintage 30 - purchased from Nathan in Melbourne. Wow! Really enjoying getting to know the new beast - just love it and once it is turned on... it becomes very hard to turn it off! I was wondering if you could send me a manual if there is such? Also there does not appear to be a serial number on the serial number plate. Is there a number you have recorded for this amp? Can I substitute pre-amp valves... e.g 5751 at any point? I love their softer breakup at higher gain levels. 15 watt Buddy combo with reverb. Ok I will start by listing some of my previous amps I have owned and giged with. And many more just too many to list. Got some great tones out of some of the amps listed above but none came even close to my new Sherlock 15 watt buddy amp. The Buddy has a tone that I have been searching for since I first became a tone freak. Sounds really good at low volume levels but like all good hand wired amps this Baby really comes alive when pushed hard. volume level. This amp sits really well in the mix and you never find yourself getting lost in the mix. I play a PRS custom 22 and this amp really brings out my guitars tone like no other amp has done. like I have 4 100 watt heads or running at the same time ITS MASSIVE. Clean sound is really nice but add the reverb on it and you have HEAVEN. The reverb sound is really high quality and I am just in love with how it sounds. If you are a solo man then single notes on this baby will meet your every need as they sing like I have never heard before. I don’t know what Dale Sherlock does to get this tone but its most defiantly the biggest kept secret in the world of TONE. If you run pedals like me then your in luck because this amp loves pedals and takes them really well. Plenty of head room on board if you want to run the amp really clean but if you want that slight break up sound that so many crave then it does that sound second to none. In my opinion Sherlock amps are the best amps on the planet and I think I have tried enough to be a fair judge. I have a bass guitar – will it hurt the Buddy to put the passthrough it? Nay particular settings that wold help with the lower frequencies? Also I meant to tell you how much I love this amp – it has the most amazing sparkling cleans and a nice bluesy tone with the gain up – to get a rock crunch requires a pedal but it takes all pedals nicely. 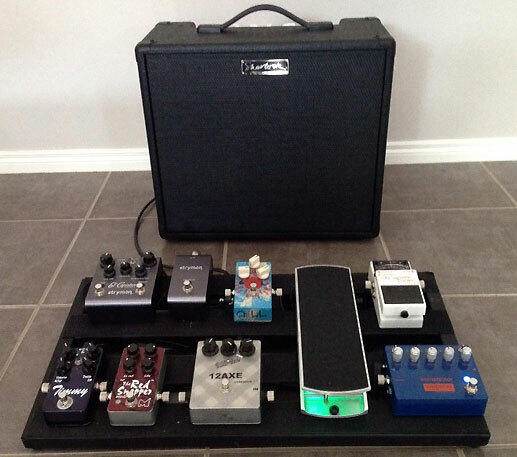 I recently purchased the ‘Buddy’ as a rehearsal and small venue amp; relegating my Sherlock ‘Bufftone’ to larger gigs. The ‘Buddy’ is a powerful little unit and punches well above its weight at 15watts. Its beauty is in the simplicity of its design and its quality components (I opted for a Celestion Vintage 30 & Vintage SAG Rectifier). It also delivers a beautiful warm and round vintage tone which can be driven harder or restrained by the Master & Gain control. In short, the ‘Buddy’ is unbelievably good & is highly recommended. Gave the Buddy a little try out today. Great sound and impressive finish. Very Happy. I bought the Buddy to play with my Strat but I'm really liking the way it sounds with my acoustic as well (I hadn't considered this before). I think this little amp and I are going to have a long serious relationship. Ps: Is there a service manual available for when I have to change valves etc? Just fired up the Sherlock Angry Ant though a 2x12" cab with 25 watts Alnico Golds. Very chimey, ballsy sound with a custom Warmoth SG with a set of P-rails and coil splitting options. Nice mix between a Hi-Watt and Plexi Marshall but at a much more recording friendly volume. You could mike this bad boy up without fear of blowing up your hi highfalutin microphones! Why has it taken me 20 years to appreciate little valve amps? Angry ant arrived safely, had difficulty tearing myself away long enough to let you know. It is superb! Made in 2005.This amp is just what I have been looking for. I play blues and rock. It is a single channel amp, but has 2 x volume controls which are footswitchable. This is great for giving solo's a boost. It also has a tube and silicon rectifier which can be switched. The silicon rectifier gives a spongy more rounder sound. The power of this amp can be switched from 100watts to 50 watts. It also has two inputs one high and one low. The controls are Gain; Bright Switch; Bass, Mid, Treble, Reverb: Volume A; Volume B ;Presence and a depth switch to fatten out the tone. It has more than enough power for me.To be honest I think this amp is perfect for me. Although I have only had this amp for a short time I could depend on it without a backup. Dale Sherlock is extremely proud of his product and therefore every component is made to exacting tolerances. I might add that this amp is handwired and not on a PCB. Dale Sherlock is extremely helpful and answers emails very quickly. When I purchased the Amp Dale put no pressure on me. He just let his product do the talking, but thoroughly explained all the technicalities of the amp. 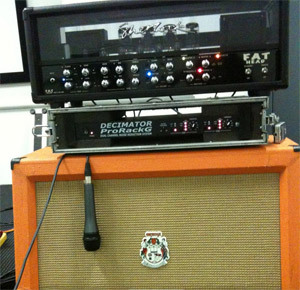 I have been playing for approx 9 years .I would definitely buy this Amp again if it was stolen. I really like the fact that this product was made in Australia by a person who cares and has a passion for his craft. It has a beautiful crystal clear clean tone. I set out to buy this product and it has surpassed my expectations. I think that sound is such a subjective thing and that is what makes music a unique human thing. One persons Amp is another’s poison. I really think this Amp leaves all the others for dead, both in manufacture and sound quality. Don't know what year it was made - was only aware of this product from the website, and on there it's a three channel number...this guy is just the one channel, but man it packs a punch. From In to Out it has Gain, Low, Mid, Treble and Master Controls, but also features Bypass Out, a footswitch to kick 'er into action as well as a MIDI plug and 'Program' button which I'm guessing allows for different EQ/Gain settings on the fly. It is voiced fairly aggressively, with gobs of gain and plenty of edge and sparkle - almost a Mesa/Boogie sound. It's basically an all-tube pre-amp but I'm using it as a distortion unit par excellence, bypassing it with the footswitch to play 'Clean' and then stomping down for some of the tightest, nastiest dirt I've heard. If it had any more knobs I'd be suspicious, but the features it does have are top notch - the feel of the pots and the clean work inside - it's all pure Sherlock. Played this with a P-90 equipped Goldtop, an SG and an ES-335, and by golly it's a brutal little beast. It's hell quiet even when it's dimed, and only gave off audible hum when running the P-90s hot (this will happen in ANY high gain situation). The sweep of the EQ section is pretty broad, with mega low end, plenty of range in scooped mids if that's your thing (I have the Mid knob nearly all the way up as I can't stand that scooped sound) and more bite than a pack of rabid dogs. The distortion is perfect for rock and metal - on lower settings you can dial in a thick Josh Homme tone then turn up the Gain for some King Buzzo fatness...pull back the mids and add more treble - you are the Metal Overlord. The sound is beautiful, transparent yet FAT. It is also highly responsive, and turning down your volume knob, even on the highest settings, takes it down a notch to a nice overdrive. I wouldn't use said sound for 'clean' tones, as it still retains quite a bit of edge. Hello Bypass function. 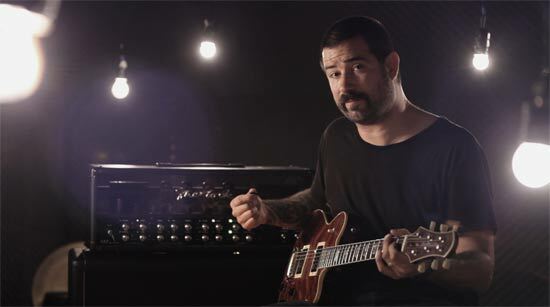 It's voicing makes it a little unsuitable for blues hounds and roots players, but for 'modern' styles and aggressive tones with authority and clarity - get some buddy. I had a play through the amp last night; it's nothing short of stunning, excellent work! I've always liked the fact that that amp brings out the character of the guitar and now, even more so! I play in 2 bands and use either a Rickenbacker 330 or a '66 fender jaguar, I rarely use any kind of distortion or effect so tone is very important to me. Its a lot cleaner (the bit of mud it had is gone) it has a lot more headroom and the individual notes in chords really ring out and you can hear them all clear as a bell (like with a good acoustic), the break up seems later and a bit different with these tubes too, I like it a lot. I will definitely come and buy one of your amps one day, I imagine that they would be even better than this one. I'm just getting in touch to let you know I used the pedal board last night at practise and it worked great. I'm very impressed with all your hard work. Now I just need to start practising my tap dancing for when we play live. If you put the picture you took on your website at some point here is the link for my band's Myspace profile. Ric here (you modded my 5150 a couple of weeks ago). Mods are awesome, everything is rocking along with the amp. Great job. I had a look at the 10m midi cable you had made for me ages ago and it is only a 5 pin. Any chance I can commission you to make me a 10m long 7 pin midi cable? Any chance it could be done by the weekend? How much would it set me back? The mods you did on my Blues junior are phenomenal! Great tone for both my Strat and LP Custom. Hard to believe its the same amp. Do you make a Blues Jnr midi switcher? Sounds a bit big for my needs. I'll come back to it if I can't find anything more compact on the market. Thanks again for a bloody great amp. Can't believe its the same little BJr. as the one I dropped off at your workshop. If your Buddy sounds like that off the shelf, I'm telling folks to forget about the BJr and go straight to Sherlock! Thanks so much for fixing my amp the other day. It sounded Massive!!! Its tha amp that I continuously fall in love with, more and more. And when I've had it with it... there's usually a valve or cable thats not pulling its weight. Im just emailing you to let you know that the work you did on my Epiphone Galaxie is great! The buzzing/humming has been drastically reduced. lower volume now and the transition is much smoother. right point where i wanted it and it sang like a bird, cheers. thanks again bro. speak soon. I spent a bit of time with it yesterday afternoon and its WAY better than it used to be. Also, the volume pot is excellent. I can get great tone at a much lower volume now and the transition is much smoother. Just want to thank you for the great job you did in repairing the Kasha. I got the amp unpacked and plugged in on the weekend...sounds great and top class workmanship on the inside! Yes, it's the correct power supply. I had a black power supply from you when i had my laney amp years ago, lent it to someone and never got it back. I can always rely on your products. I reckon your the best in australia, and i mean that. It was nice talking to you again after all these years. Thanks for job done on my JCM 800 very happy with work and amp plays beautifully. 3 sets of tubes though. Job well done. Take care until next time.. Thanks for the work on my Hi-Watt 50 watt head. I had been neglecting it and now it sounds like new again! The last time I can remember my amp being that quiet, but also that dynamic and "full" is when it was brand new. I am so happy I finally found a tech that was able to fix it. Thank you so much, I'll be forever grateful. Your comment about being "reborn" couldnt have been more accurate. just wanted to drop you a note to thank you once again for fixing my amp in such quick time.As with the other times you have done work for me the quality of service and workmanship was fantastic.I know you have probably got heaps of work anyway but i will certainly be recommending you to people.Also thanks for the info on amps you gave me. the amp was having some problems in its 30th birthday year, after your service it sounds like it was made yesterday! One problem, I will be hassling you for ALL my amp repairs from now on. Just a quick note to say thank you for an excellent job on the refurbishment of my 64 Fender Bassman cabinet and amp. head. The Tolex covering and speaker cloth look great.